The display of Tax Discs on vehicles all started back in January 1921, with the implementing of the Roads and Finance Act 1920. This Act decreed that all mechanically propelled vehicles within the United Kingdom pay duty for the use of The King's Highway, and although, greatly amended, is still currently on the statute book to this very day. The passing of the 1920 Act greatly tidied up what was at the time an extremely confusing situation, and we must remember that motoring was still a relatively "new" method of transport then. Prior to this act being passed various forms of taxation had been implemented , with reference to "Locomotives", number of wheels etc. appearing in both the 1888 and 1896 Acts. The first reference to a "motor car" appeared in the 1903 Motor Car Act. The Finance Act of 1910 introduced the hated "Horsepower" rating which was formulated by the Royal Automobile Club and subsequently became known as "Treasury Rating". Unfortunately this formula did not take into account the length of an engine's stroke and in order to keep the Horsepower figure as low as possible, long stroke engines with small diameter piston areas were the order of the day. Squared and over squared high compression engines took many years to evolve as a result of this ruling! However, there was at least an accepted method of determining an engine's size for annual taxation purposes, with the initial rule of thumb being that One Horsepower would cost £1. 1921 saw the responsibility of issuing "Tax Discs" change hands, from Her Majesty's Customs and Excise to the various County Councils that were in exist ence at that time. During the years 1921 and 1922 Tax Discs were by today's standards quite basic lain p paper, black ink with simple instructions on the reverse and no perforations. Life itself must indeed have been simpler in those days. 1923 saw the introduction of background intaglio printing, together with an overprinted green band. Various colour changes took place thenceforth for every Year's licence until 1938 when perforation was added to the outside diameter circle. Perforation continued to be used until 1942 with 1943's licence being issued unperforated and each subsequent year's annual licence remaining un-perforated until 1952, when once again perforation was resumed. 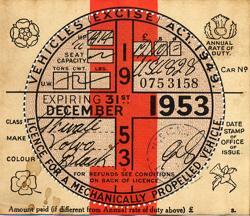 The Thistle Shamrock Daffodil and Rose symbols were removed from the face of the Tax Disc in 1951 to make way for a bolder expiry date whilst the background intaglio changed in 1938 from "Road Fund Licence" to "Mechanically Propelled Vehicle Licence". 1957 saw a change, in what for many years had been accepted as the normal design for Tax Discs with the introduction of two solid bands of horizontal colour to the top and bottom of the disc, and in 1961 a further change was made with the introduction of what was considered to be at that time further discouragement for forgery, with a new design consisting of various circular vignettes and bands of solid colour. The years of 1961 and 1962 were however, to the less scrupulous, relatively easy to "amend" to their own advantage therefore in 1963 an additional expiry date, printed in a light tint on the lower half of the disc quickly put an end to this practice. Duty payable to the Government, as was mentioned earlier, initially set at £1 per Horsepower in 1920, and over the ensuing years has changed quite considerably with odd anomalies here and there. To that end your facsimile Tax Disc has had inserted for you, the correct duty that would have been paid in January of that year for a period of 12 months road use, accounting for the capacity of the vehicle. Should you choose to display- your facsimile Tax Disc on your vehicle, on the public highway, then naturally you are required by law to display a currently valid DVLA Tax Disc in its designated position upon the vehicle. Purchase a tax disc for your classic car.